FEU outlasts UST in Game 3, crowns UAAP 78 basketball champions (Video Highlights) - Balita Boss! 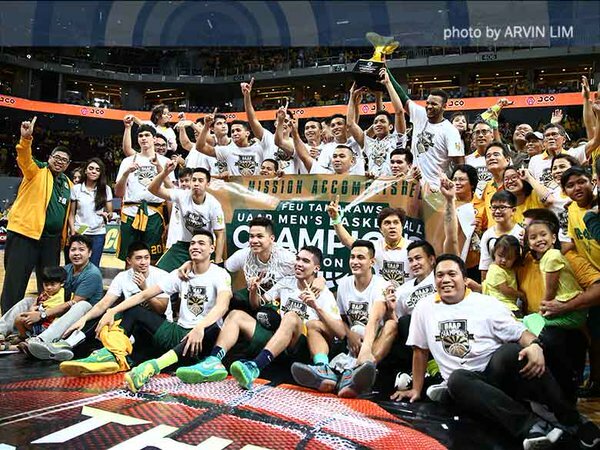 The FEU Tamaraws were crowned the UAAP Season 78 men’s basketball champions after outlasting University of Santo Tomas, 67-62, in a winner-take-all Game 3 for the title on Wednesday (December 2) at the Mall of Asia Arena. The FEU Tamaraws has regained the basketball crown after 10 years of waiting and being runner-up in their past 3 finals appearances in 2010, 2011, and 2014. Mac Belo, who played his final game for the Tamaraws, scored 23 big points and 8 rebounds in the victory. He was named Finals MVP with averages of 17.3 points and 10.7 rebounds. Roger Pogoy scored seven huge points in the final three minutes and seven seconds, including a clutch 3-pointer, to overpower the Tigers. Mike Tolomia had 13 points after a seven-point performance, missed all 15 of his shots from the field in Game 2. Ed Daquioag led UST with 21 points and 4 boards while Karim Abdul had 12 points and 5 rebounds. UST’s Game 2 hero Kevin Ferrer was limited to just 6 points on 2-of-7 shooting after an epic scoring performance last Saturday with 29 points, firing six straight triples in the third quarter.